I’m sure you’ve heard the expression, “A calorie is a calorie.” It means that carbohydrate, fat and protein calories are equal in terms of their effect on body weight. This point is most often made in the context of debates between low-carb and low-fat diet advocates. Those who say “A calorie is a calorie” in this context mean to suggest that macronutrient proportions are irrelevant to weight management (as long as one is getting enough of each to meet one’s basic health needs). All that matters is the total number of calories consumed, regardless of whether the plurality comes from fat or carbohydrate. Weight management is a simple game of math, these folks argue. To maintain your current weight, you need to consume the same number of calories your body burns each day. 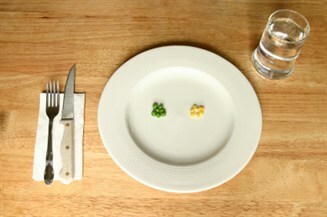 To lose a pound, you need to create a caloric deficit of approximately 3,500 calories. Whether you create that deficit by eating less fat, less carbohydrate, less protein or a little less of everything is immaterial. It sounds sensible, but it’s actually not true. A calorie is not a calorie, in more than one sense. Carbohydrate, fat and protein calories are indeed equal by definition in terms of their energy content, but the body processes each in a distinct way, and these differences have real implications for weight management. In addition, food calories of all types may have very different effects on the body depending on when they are eaten and what they are eaten with. Following are five specific reasons why all calories are not equal. The body must use energy to digest, absorb and metabolize the energy in food. And it so happens that the body uses different amounts of energy to process different energy-containing nutrients. Generally, more energy is required to process protein than carbs, and more energy is required to process carbs than fat. What this means effectively is that a 2,500-calories-a-day high-protein diet adds fewer calories to the body than a 2,500-calories-a-day high-carb diet, which in turn adds fewer calories to the body than a 2,500-calories-a-day high-fat diet. Admittedly, the differences are small. They do not in themselves constitute a rationale to consume a high-protein, low-fat diet for weight management. The biggest problem with using linear calorie equations for fat loss is that the fewer calories you consume, the fewer calories your body burns. Thus, if, based on the 3,500-calorie rule cited above, you decide to cut your daily energy intake by 500 calories in hopes of losing a pound a week (500 calories/day x 7 days = 3,500 calories), you will probably find that you do indeed lose a pound in the first week but less in each subsequent week. This phenomenon is believed to represent a metabolic adaptation to prevent starvation. Your body literally runs cooler to conserve the reduced number of calories you’re eating, thereby effectively increasing the value of each calorie. A 2006 study published in the Journal of the American Medical Association reported that volunteers who maintained a very low-calorie diet for six months exhibited a significantly greater reduction in metabolic rate than could be explain by weight loss alone. A longer-term study on monkeys revealed that monkeys whose food intake was reduced by 30 percent for 11 years exhibited a 13-percent lower metabolic rate than weight loss alone could account for. More relevant for our concerns as athletes is evidence that even small calorie deficits within a single day may alter our metabolism in ways that have negative effects on our body composition. A study involving elite female gymnasts and distance runners found a strong inverse relationship between the number and size of energy deficits throughout the day (that is, periods when the body’s calorie needs exceed the calorie supply from foods) and body fat percentage. In other words, the athletes who did the best job of matching their calorie intake with their calorie needs throughout the day were leaner than those who tended to fall behind. What’s important to note about this study is that the effect of mini calorie deficits was independent of total caloric intake for the day. This means that a woman athlete who requires and consumes X calories a day is likely to have less muscle and more body fat if she does not time her eating well than if she takes in the same total number of calories but distributes them more evenly throughout the day. 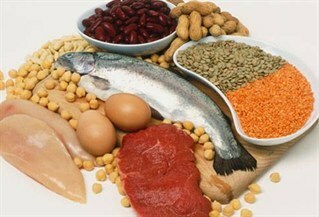 Protein generally reduces appetite more per calorie than fat and carbohydrate. Therefore a person who increases his daily protein intake without making any conscious attempt to eat less is likely to eat less anyway due to reduced appetite. 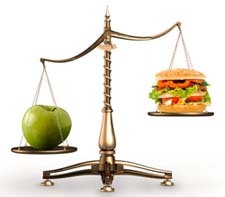 This is another important sense in which protein, carbohydrate and fat calories are not equal. In a recent study from the University of Washington School of Medicine, 19 subjects were fed each of three diets sequentially. For two weeks they followed a weight-maintenance diet comprising 15 percent protein, 35 percent fat, and 50 percent carbohydrate. For the next two weeks they followed a high–protein diet of equal calories. The macronutrient breakdown of this diet was 30 percent protein, 20 percent fat, and 50 percent carbohydrate. Finally, the subjects switched to a high-protein diet with the same macronutrient breakdown but no calorie restriction—subjects were allowed to eat as much or as little as they pleased (or “ad libitum”). They stayed on this last diet for 12 weeks. The authors of the study reported that when subjects switched from the low-protein weight maintenance diet to the high-protein weight maintenance diet, they started feeling much fuller despite the fact that they were consuming the same number of calories. Even more significant, during the unrestricted high-protein diet phase, the subjects voluntarily reduced their daily eating by 441 calories per day and lost almost 11 pounds, including more than eight pounds of body fat, on average. Thermic effect of food (TEF) is a fancy name for the energy used up as a result of digesting and absorbing a meal. A study published in the American Journal of Clinical Nutrition found that TEF is higher in the morning than in the evening. Volunteers were given an identical 544-calorie meal at one of three times. In subjects fed at 9 am, TEF increased by 16 percent; in those fed at 5 pm, TEF increased by 13.5 percent; and in those fed at 1 am, TEF increased by only 11 percent. So it’s clear that we burn more calories in the morning. The effect of calories on body composition is also influenced by the size and frequency of meals. For example, a Japanese study found that boxers placed on a six-meals-a-day weight-control diet lowered their body fat percentage significantly more than boxers who ate exactly the same number of calories in just two meals. Generally speaking, food calories are more likely to be stored as fat and less likely to be used immediately for energy, stored as glycogen, or used to synthesize new muscle proteins when they are consumed in excess of short-term needs. This is why six small meals totaling 2,500 calories are not equal to two large meals totaling 2,500 calories. On the flipside, food calories are more likely to be used immediately for energy or stored as glycogen or used to synthesize muscle proteins when they are consumed at times of energy deficit, such as first thing in the morning after the overnight fast. Another such time is after exercise. Numerous studies have shown that people build more muscle and gain less body fat (or shed more body fat) when they consume adequate calories within two hours after exercise than when they do not, despite consuming the same total number of calories over the course of the day. To be sure, counting calories has some value. However, for the reasons cited above, you can’t count on calories from any source to affect your body equally in all circumstances.